I am talking about SHEEPSHEAD and not the traditional method of a fiddler soaked up in or almost in the rocks. I am talking about fishing in open water with NO big rocks to break you off or cut your line. That's right, open water. Open water where you can use six or eight pound class tackle and rods and reels that you would bream fish with. About this time of the year we have a migration of stud sized sheepshead that come in the inlets to breed and during this time you can flat have some hootin and hollerin fun and take some darn fine table fare home. I like to set up on the edge of a drop, whether on a deep channel or a sand bar drop. You can do this in water from a few feet deep to depths of around thirty feet or even more. The rig that I have found to work best for me is the traditional slider or fish finder rig, for you bass anglers, the carolina rig. I have been using the Pflueger Trion 46, spooled with 10 pound test Power Pro. From the line on the spool, I slide on an egg sinker, from one to three ounces, depending on the current speed. I then tie to the Power Pro, a small barrel swivel and to that a piece about ten to twelve inches long of twenty pound Cajun Lighting monofilament. To the leader, I tie a Daiichi Bleeding Bait, Straight Eye, Straight Tie, Wide Gap hook. For the rod, I prefer one about six and one feet to seven feet long with a super light tip and a strong backbone about one half way down the rod. So far I have had more fun than a barrel of monkeys with the Shakespeare Ugly Stik Lite or Custom rods. Now for the bait, earthworms, big fat red wigglers, the juicier the better. Not really, just teasing. The bait that I have had good success with is oysters, clams, shrimp (peeled) and small pieces of crab. Put a piece about the size of your last thumb joint on the hook and toss it out, get a tight line and hold on. The bite is not like you would expect, it is a tap, tap, tap. Nothing like sheepshead fishing with fiddlers up around the rocks. Sometimes they even hook themselves but you might want to hold the pole as they still have that uncanny ability to get the bait without you knowing. So far I have not found one tide that consistently produces better than another. I seems like the fish bite better in shallow water on the outgoing and in deeper water on the incoming. Back off on the drag and have some fun, I have been. Capt. 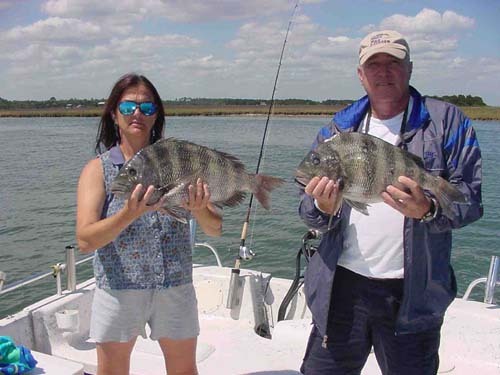 Becky Hogan and Capt Ron Gunter with a couple of very nice sheepshead, caught while on a trip with Capt. Jim Hammond of Fun Fishing Charters. Now how about some local action. The ocean bottom fishing is producing some nice catches of beeliners, seabass, snapper, grouper, trigger fish and a few cobia. Try a live minnow for the grouper and snapper and an exude glow in the dark shrimp for the seabass. I like a small bait about the size of the joint on your little finger for beeliners and triggers. The ocean trolling boats that have been making it tot he stream have had good numbers of mahi, tuna, wahoo and a few sails. Try an Island lure rigged with a ballyhoo, green for mahi, for wahoo try red/black, purple, black or glowing the dark orange/black with a triple hook rig and a big ballyhoo. Send a couple down deep and a couple on the surface waaaaay back. The inshore waters are starting to produce a few trout on shrimp, mud minnows, MirrOlures, Gotcha trout grubs in gold flake and white with a green tail, hooked to a Jaw Jacker 1/4 to 1/2 ounce lead head jig (fish it slow). The reds are taking gold spoons, small crank baits (like the MirrOlure freshwater jointed baits), a rootbeer and clear with gold flake Gotcha trout grub. Also try a mud minnow on a jig or a small cork rig on the higher water. A few flat ones are starting to show up and I have been catching them on just about anything I throw, minnows, shrimp, grubs and small spoons. The small spanish and blues are at the inlets and a few have made their way into the creeks. I like a CLARK Spoon for these with a small piece of wire leader tied to the spoon and then to the line on the reel. Try a small piece about three inches long and as light as you can find. I went to Little River Georgia Plantation in Ashburn Georgia last month and had a blast, killer largemouth bass fishing. Here is Jamie Deonas of Deonas Boat Works with a nice ten pounder from the trip. Remember moms and dads, take you sons and daughters fishing and you WILL NOT be looking for them come Friday and Saturday night, as they will be home in bed waiting to get up early and catch the big one. Capt. 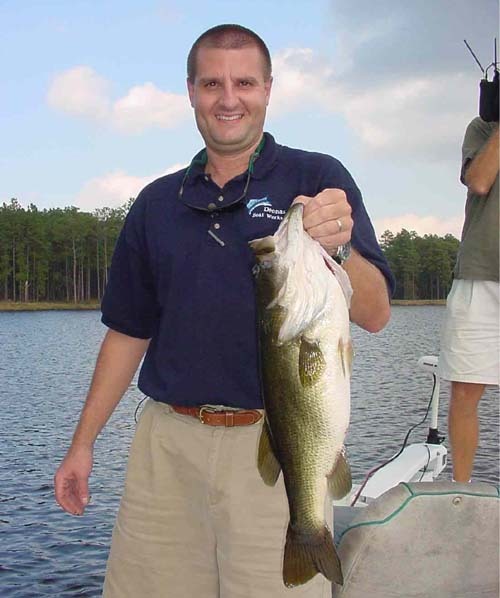 Jim Hammond is a charter captain that does inshore charters and has a network of other captains with boats from 16 to 62 feet to handle your charter fishing needs from the backwaters to the gulf stream.